A new curriculum makes design-build projects into a part of every student’s education. How can a well-designed home change someone’s life? During the 2014-2015 school year, some high school students in Berkeley, California, asked that question as they took on a big project: to build a pair of tiny houses. Affordable housing is a huge issue in Berkeley, so the students started their project by pondering questions like: How does a house empower a person? What does affordable housing mean for a community? From this process of questioning and research, the group of 85 students designed, modeled and built a pair of stylish tiny houses, just 100 square feet each, with space to read, relax and sleep. 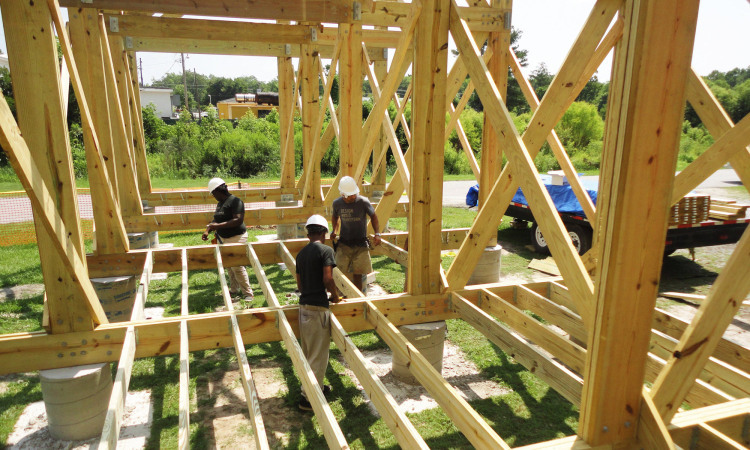 Over the year-long project, the students learned serious construction skills. Meanwhile, they also learned skills like teamwork, problem-solving, critical reflection and even legacy building, as they followed where the houses ended up: One of the tiny houses was purchased for a mother and young daughter, while another was placed at Opportunity Village in Eugene, Oregon, a community for people transitioning out of homelessness. This is a typical project for Studio H, an in-school design-and-build program now based at REALM Charter School in Berkeley after its launch in Bertie County, North Carolina. By leveraging skills traditionally taught in “vocational education” — what many educators now call CTE, for Career and Technical Education — co-founder Emily Pilloton (TED Talk: Teaching design for change) hopes to teach all schoolkids the kinds of skills they’ll need to thrive, like ground-up problem solving, kinesthetic learning and community development. Offered as an elective to middle- and high-schoolers, Studio H enrolls 100 students each year; more than 500 young people have graduated so far. But Pilloton has a bigger vision, and after requests from teachers all over, she’s now extending the Studio H program into a curriculum any teacher can use. It’s called Unprofessional Development, a program teaching community-based, hands-on learning to educators. Through workshops, educator resources and consulting, Unprofessional Development encourages teachers to adapt Pilloton’s lessons to their own classrooms and their unique local needs. Here are the big ideas behind the program. 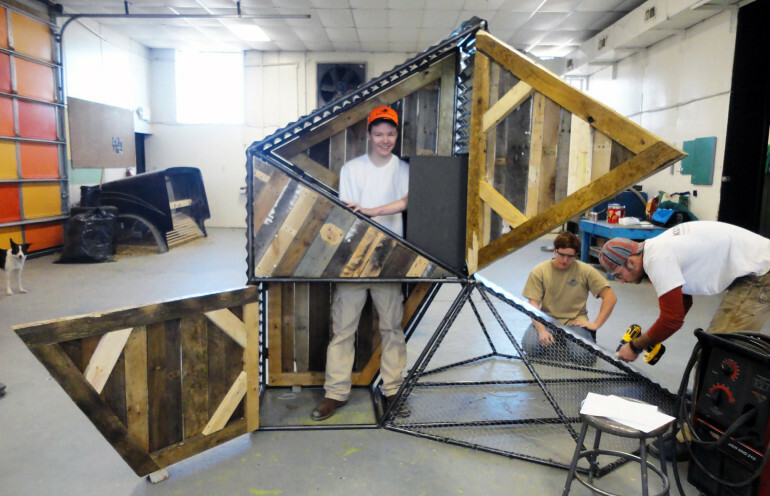 Through Project H, these students sketched out and constructed a forward-looking chicken coop. Courtesy of Project H Design. Building things can connect students and their communities. Studio H, which Pilloton founded with partner Matthew Miller, emphasizes creativity and skill development geared towards benefitting the common, local good. To date, participants in the program have completed 38 projects, from a farmers market to a flexible-use classroom made of shipping containers to a chicken coop. The students are involved at every step, from deciding what to build through to construction, and they pick up specialized skills such as model fabrication, metalworking and carpentry along the way. For Pilloton, it’s important for class projects to extend beyond the school grounds — and for schools to be sources of community and centers of local progress. Students forge new links to their hometowns when they can solve challenges for their families and neighbors. As an example: Despite being a region filled with growers, rural Bertie County in North Carolina had no farmer’s market. It was a food desert in the midst of plenty. 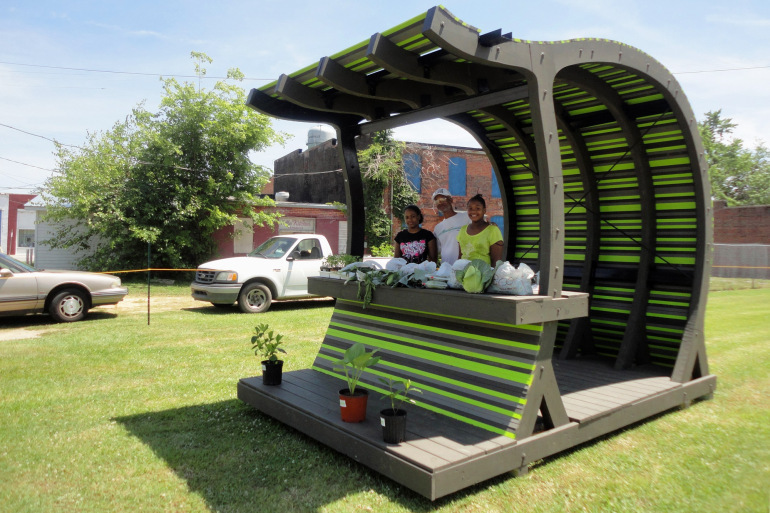 Studio H students addressed the problem head-on by designing and constructing a 2,000-square-foot farmer’s market in 2011, with some more farmstands the following year. Many of the market’s builders have graduated from college since then, and one student has returned to be part of the co-op that runs the market. For others, the structure stands as a visible reminder of the positive contribution they made to their community. “The farmer’s market is deeply embedded in their hearts and minds,” Pilloton says. Proud students pose with one of the farmstands they built to make fresh produce accessible to residents of Bertie County in North Carolina. Courtesy of Project H Design. Design-build projects can help students develop empathy. Building creates consequence, Pilloton says: “When you build, you’re thinking about things that are bigger than you, and you require the trust of others.” Rather than applying their skills in a vacuum (or on paper), students in her program must consider the needs and feelings of their users while they create their projects. The Berkeley students who built the pair of tiny houses, in fact, came up with this project idea on their own, says Pilloton, after hearing their own families and friends struggle with the housing crisis in their hometown and around the San Francisco Bay Area. 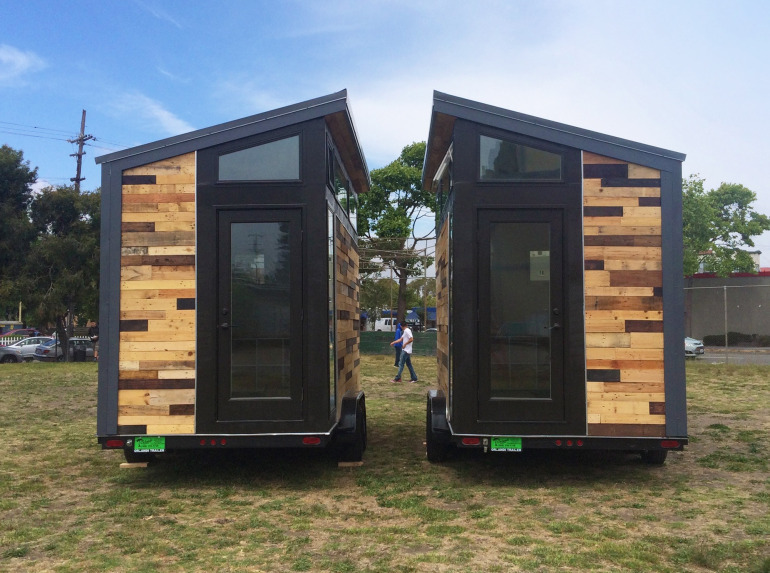 This pair of tiny houses were intended to address the problem of affordable housing in the San Francisco Bay Area. Three years later, the students still get updates from the people who now live in them. Courtesy of Project H Design. Design projects encourage new kinds of thinking. A popular tool in architectural education is the “precedent study,” a close examination of similar or analogous structures. The precedent study is a staple part of the Studio H curriculum, encouraging students to look for lessons in the world around them. For example, they might consider: What should a farmer’s market learn from a horse stable? What about a freight container? “It’s a practice that opens up your brain,” says Pilloton. To write their precedent studies, students practice research techniques not often used in traditional schooling, like conducting in-person interviews with neighbors or making site visits. By practicing inquiry and meta-cognition — that is, thinking about thinking — Studio H tries to prompt students to consider the behaviors, habits and activities of their intended audience and respond to them through design. For example, at the start of a project with some eighth graders at REALM, instructors asked kids about their favorite part of the day. Their answer: “Recess” (naturally). But what was it, exactly, about recess that was so appealing? Through reflection and discussion, students identified recess’ opportunities for discovery and for exploration. To come up with a project that would harness these qualities, the students decided to design and construct a modular school library. It offers mind-expanding books — but is also a physical space that can be continually reconfigured. 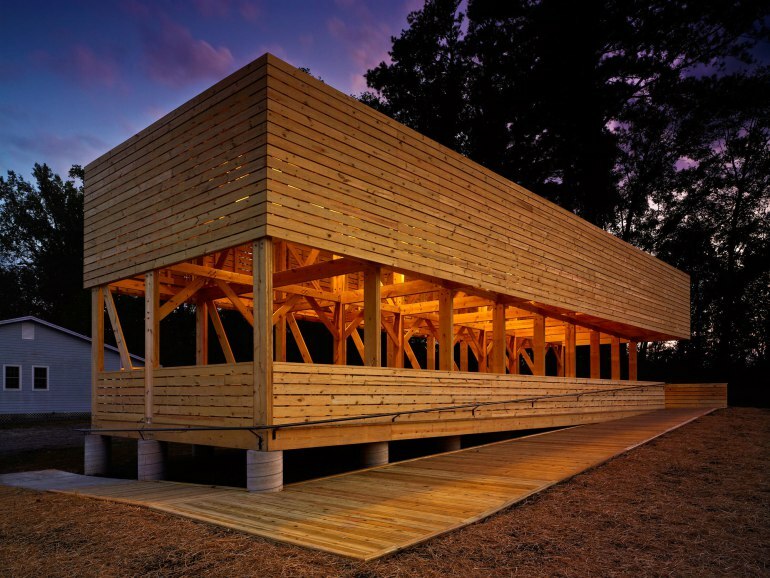 The student-built Bertie County Farmers Market, as seen in Architectural Record and other high-profile design magazines. Students were well aware that their original work drew international interest. Courtesy of Project H Design. Finally, building something tangible can foster pride. Seeing their projects out in the world provides legitimacy and affirmation that the students’ work is real and important, says Pilloton. When the Bertie County farmer’s market was covered in respected industry journal, Architectural Record, every student on the project received a copy of the issue — a lasting memento of the work they had brainstormed, designed and built by hand. Lila Allen is a design writer and researcher based in Brooklyn, New York. This piece was adapted for TED-Ed from this Ideas article. So you want to be an archaeologist….